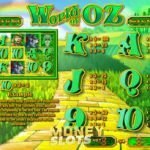 World of Oz is a 5 reel 50 paylines slot game released by Rival in 2006. You don’t need to find a pair of red shoes to get there cause in this engaging game you get there right away. The Wild in this game is the Wicked Witch symbol which will substitute other symbol to create a winning combination. Your wins also come with a nice 5x multiplier. There is just one scatter in this game and it is the Great Oz symbol. Landing 3 or more anywhere on the reels will reward you with 12 Free Spins and 25x on your bet. You can also trigger 7 Emerald Spins if you land 3 more Great Oz during your free spin rounds. Another nice feature comes with the Scarecrow, Tin Man and Lion. With each win they work like a cascade feature and they are immediately replaced with other symbol thus giving you 1 more free spin. 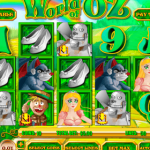 You can see why World Of Oz was pretty popular at its time. But should you really spend your time and money on it? We’re not so sure unless you’re a big fan of the Oz series of books. If you’re a fan of Christmas and winter in general then maybe you should consider playing Winter Wonders a 5 reel slot by Rival.